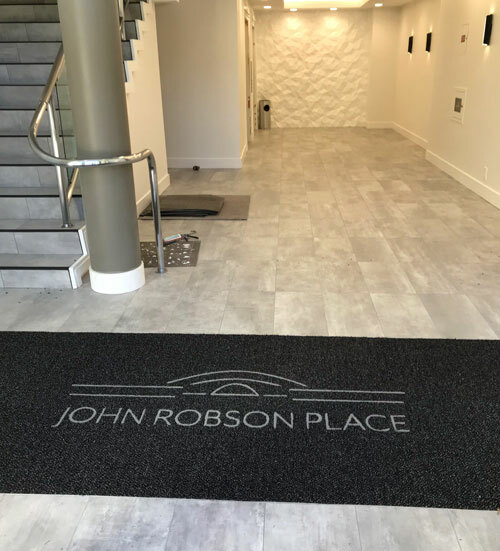 John Robson Centre - Commercial Flooring & Mats Vancouver | Source Floor & Specialties Inc.
We created this custom inlaid logo mat for the John Robson Centre here in Vancouver using our Grizzly FX in Onyx, with a Pearl Grey inlay. This particular mat was cut and inlaid here in our production shop, but was the installed into a recessed well on-site. That’s why this mat has no edging in these photos – the bottom and right-hand-side edges were cut here to ensure that the logo was properly centered for the doors on site, while allowing extra material above and to the left of the logo to account for any irregularities in the recessed well.